okay, enough of us being the ones who are doing all the praying, today it’s your turn!! so what are the things you want to pray about in regards to Spark 08? what do you have on your mind and heart that you want to give over to God? why not put your own prayers up on this blog by leaving a comment below? it’s that simple! it’s over to you – go for it!! each morning at spark, before we go to our individual areas and projects, we are gathering together as one huge collection of people to take time to meet together, pray together, laugh together, worship together and get involved in God’s word together. last year, many of you commented on how these times were one of the highlights of your week, and we’re hoping the same applies this year. and so today we want to pause and pray for these morning gatherings. the theme we are focusing on this year is ‘HOPE’. hope is a word that’s been used so much in our country over the past year or so. we’ve had the hugely successful ‘celebration of hope’, as well as numerous events, initiatives, books, songs and cds called hope. it’s kinda been the buzz word! 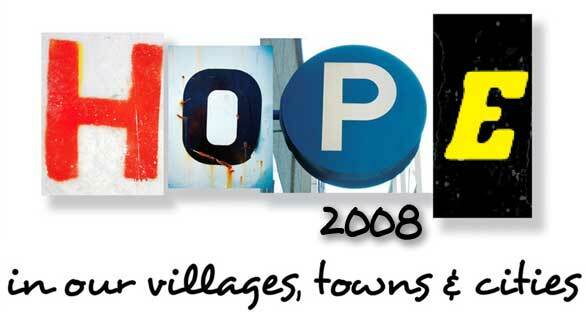 when thinking about Spark 08, it seems that Hope is the word which best describes what we’re wanting to bring to Ballymena. Hope as we cut people’s gardens. Hope as we help those who feel helpless. Hope as we pick up litter on the streets. Hope as we chat with residents about what were doing. Hope as we play with kids who few friends. Hope as we pray for those we’ve just encountered. Hope as we invite young people to events. Hope as we share our own stories. Hope as we worship together each morning. Hope as we encourage churches. and so, much more than a cliche or a nice phrase, we want Hope to be a living reality in Ballymena next week. because Hope is more than a word. Hope is a Person and His name is Jesus.